Pete had a degree in public communication from Boston University when he arrived on the Kansas State University campus in 1977. Like so many young people, he was unsure what he wanted to do with his life and hoped more schooling might make things clearer. Somehow, a K-State faculty member he had spoken to convinced this grandson of Portuguese immigrants, a man who had never been west of the Mississippi River, that Kansas was the place to go to complete his education and maybe find himself. Much of his time here involved being a photographer for the K-State Collegian newspaper and Royal Purple yearbook. He left two years later, two credits shy of receiving his master’s degree. He worked for a time at the Hutchinson News and the Chanute Tribune. These facts don’t inspire thoughts of an exceptional future. But Pete says those years served as the launching pad for his career. And what a career it has been! I didn’t know him when he was here as a master's degree student. I believe we first met in October 1986, when he and a few others had envisioned the book project, “A Week at K-State.” He was joined by 44 other photographers, some still students and others who were alumni. They spent a week taking pictures of life on campus. The book was published the following year. He had been late arriving for the project because he had been “busy” in Reykjavik, Iceland. As White House photographer, it was his job to document the historic summit between President Ronald Reagan and Soviet General Secretary Mikhail Gorbachev. The next time I saw Pete was in April 1987. I was attending a journalism conference in Washington, D.C. He had a security clearance in the Reagan White House and arranged for some of us to take a tour. Early in 2006, he participated in a K-State photo project - “Visual Conversations.” He was back in December, when he returned as the commencement speaker. His speech and a campus exhibition of his photos earned him those two missing credits needed to secure his master’s degree. In November 2011, Pete was included on The New Republic’s list of Washington’s “most-powerful, least-famous” people. He jokes that he’s logged more miles on Air Force One than any president. He has rubbed shoulders with leaders from around the world and has more than two million Instagram followers. Today, it’s not unusual for him to post photos of Obama as well as his pet tortoise Charlotte. Among some of those iconic photos are both presidents at their desks in the Oval Office, watching movies with their wives in the White House, and sharing time with the family pets. He also captured serious moments, such as Reagan during the Iran-Contra affair, Obama in the conference room in 2011 during the raid that ended in the death of Osama bin Laden, and Obama after he heard news of the killing of 28 people during the Sandy Hook school massacre. I helped arrange Pete’s schedule for his recent visit to campus, and so know how full those two days were. Part of his time included a pre-lecture get-together with photographers and others Pete knew during his time at K-State. There was much reminiscing and laughing. Through it all, he was unassuming and down-to-earth. After the receptions, the lecture and meeting with students interested in photography, he completed his time here with a book signing at the Manhattan Public Library. He said he was going to call an Uber driver to get from the hotel to the library, but I offered him a ride with husband Art and friend Dave since we were heading out for lunch at the same time. Art kidded Dave that he’d be a real star when he got home as his wife Susan is a big fan of Pete's work and Dave had the opportunity to meet Pete face-to-face. We met him at the library after the signing to take him to the airport. As Art was backing out from his space in the library lot, a woman getting out of a nearby car was holding a book and motioning toward Pete in our back seat. She had a copy of one of his books, but a friend had delayed her arrival and she had missed the official book signing. Without batting an eye, Pete took it through the window, signed it, and handed it back to one very happy fan. Pete has worked at the Chicago Tribune and has done freelance work for “National Geographic,” “LIFE” magazines and others. He has won numerous national photojournalism awards, lectured all over the world, appeared on national radio and television broadcasts, and been closer to more famous and important people than most of us ever will. There can be little doubt that his time here in Kansas served him well. But while I am happy how things came together for him, it was that little gesture of grace to the woman with the book and his gratitude to the people who helped along the way that I find the most endearing. So if you have some time, visit the Pete Souza exhibition in the Marianna Kistler Beach Museum of Art. It will be there until April 27. 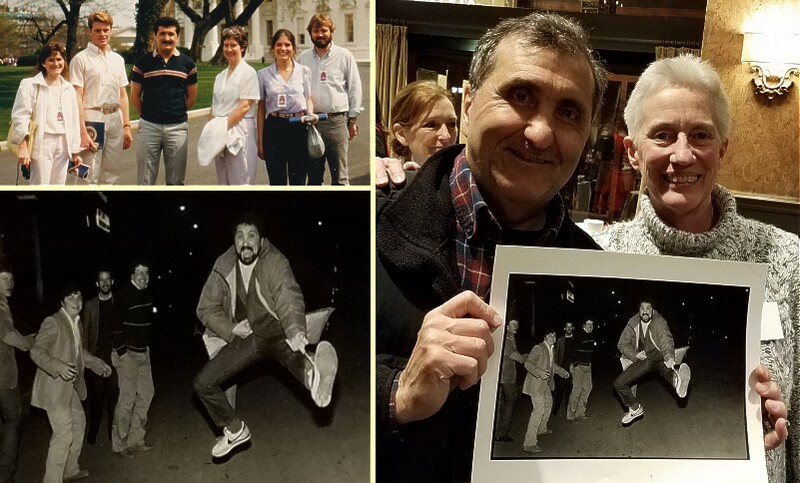 Top-left: Photo during the April 1987 tour of the White House by the K-State visitors; bottom-left: Pete "kicking up his heels" during his trip to K-State in October 1986; right: Gloria presenting Pete with the photo in the lower left during his recent visit to Manhattan.